In Hong Kong recently, I splurged on a nice Canon 10 megapixel digital camera, and I've been idly snapping photos here in Shanghai, where I've been most of the week on business. Say what you will about the place, but it sure ain't hard on the eyes. There've been a few clear days here with excellent visibility, but most of the pics I've taken--night pics of the Pudong skyline, that sort of thing--look, not surprisingly, like lame postcards. 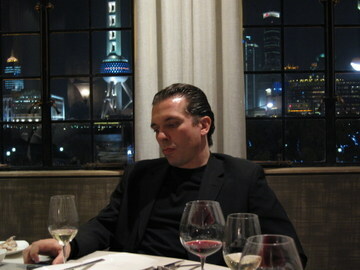 I did, however, grab a few candid shots of colleagues at dinner tonight, at a place on the Bund looking out at Pudong. Here's one of OgilvyOne China president Chris Reitermann. Looks like a movie set, I thought. Click the image for a bigger version. Didn't Photoshop this at all. I managed to go out with newlyweds Tony and Paulina for a drink Tuesday night, and had a happy hour beer with Will this evening. He and Mrs. Imagethief are moving into their new Shanghai digs today and tomorrow. Will tells assures me that it's possible to be a nerd and a Metal musician at once. thanks, Will. Another day of meetings--so far, they've all been genuinely interesting--and then it's home to the family for what I sincerely hope will be a relaxing weekend. And a birthday lunch for this most excellent fellow. Judging by the number of metal acts that send me messages and invites on Myspace I would say it is entirely possible to be both nerd and metal musician. I got one just today from a Canadian hard rock band 'Hellrazor' inviting me to check out their page. I think I'll wait until they change their name to 'Hell frozen over' before I do. Thank you for this information. It is quite useful information for me. can you please tell me more about it. I am really very much excited about it.